Hosta Ginko Craig is a great variegated hosta for edging garden spaces with low and neat with vigorous horizontal growth. Planting hosta close together allows the plants to grow to limit light for weeds. Hosta Ginko Craig have grass-green leaves with a neat wide, white edge. Ginko Craig is 6 inches tall and 12 inches wide, this is a good plant for ground cover, edging, accent plantings, and containers. It grows very quickly and easily in partial shade, topped by unexciting 2 inch lavender blooms in midsummer. It tolerates a wide range of soil types, asking only for good drainage at least half a day of shade. Heat, humidity, and cold do not phase it! Variegation remains bright throughout the growing season. Hostas are generally though of as shade tolerant plants. However, most will not fare well in deep shade. They prefer an exposure with morning sun and afternoon shade. One rule of thumb is: blue leafed hostas require shade and the gold, yellow and white leafed hostas will tolerate more sun. 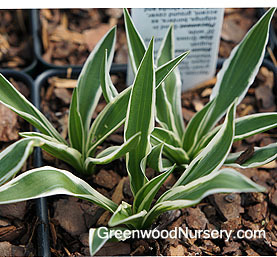 Fragrant hostas need 5-6 hours of sun per day. A morning sun area with early afternoon sun works best for the fragrant blossoms. They grow best in rich organic soil. In many soils organic amendments may need to be added. If you test your soil, a higher pH is preferred (6.5-7.5) enriched with nutrients and organic matter. Materials such as compost, leaf mold, aged manure, Canadian peat moss, composted pine bark and sludge products such as Milorganite and Com-Til can be added as the organic matter. Dig a hole 12-14 inches deep and approximately 12-16 inches wide. Remove from container and shake the potted soil off the roots and untangle as much as possible. Dispose of the container soil and plant at the same level as the plant grew in the container. Hostas are slower growing and take about 4-5 years to produce a mature plant. Regardless of the fertilizer you choose, be sure to follow the directions on the label. Do not apply any fertilizer on top of or on any new growth, eyes, or leaves of the hosta. A balanced granular slow release fertilize such as a 10-10-10 can be applied in early spring followed by 2 more applications in 6 week intervals. However, if you have added organic amendments, you may not need to fertilize. A soil test can show if fertilize is needed. One inch of water per week will keep hostas moist and perky. The source can be from rain or hand watering. A deep watering is better for root development. If the hosta isn’t getting enough moisture the leaf tips will show burning and/or dropping leaves. Hostas can be divided beginning in spring. But, summer dividing is generally preferred. The warmer soil and higher humidity during summer help to speed up the root development and any top growth. Water often during the first two weeks after dividing plants. Lift hosta clump out of the ground and wash the soil away from the root system. Take a sharp knife and begin cutting into desired divisions. Keeping any large leaves from growing on the new divisions will help to reduce water loss. Frequent dividing of hostas will limit their growth and keep them from growing into a mature plant. When hostas finish blooming, the stems (scapes) can be cut off. This will force more growth into the plant itself. Once leaves become discolored or killed by frost, they should be trimmed back to the ground. Snails and slugs can often cause damage which will be in the way of small round holes in the leaves. This generally happens more to the thin leafed varieties and younger plants growing closer to the ground. Blue hostas actually have green leaves with a wax that makes it appear blue. Exposure to the sun and heat will often melt the wax and the blue hostas will become green. Plants shipping to AZ and CA addresses will be bare rooted and root wrapped before being prepped for shipping.